Life during the Viking Age in the Norse realms wasn’t as dull as some people assume. On the contrary, the Norsemen had been practicing a series of games and sports that nowadays we collectively can call entertainment. 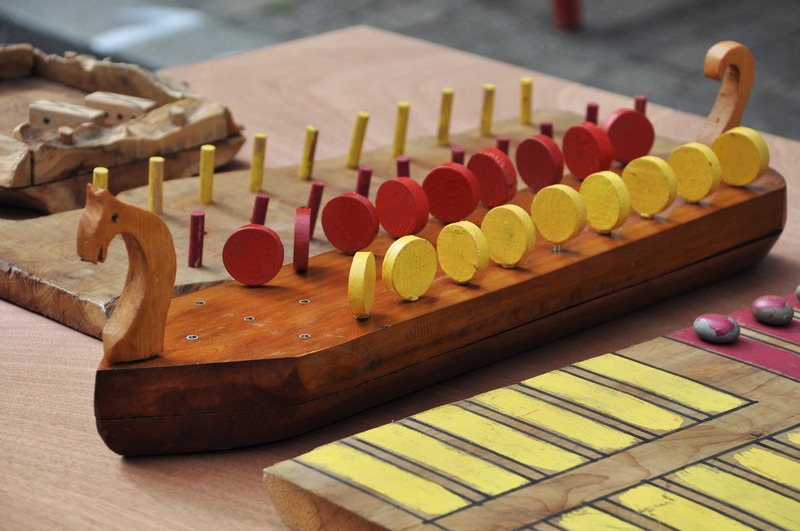 According to medieval Icelandic literature and archaeological discoveries, it is known that they played both indoor and outdoor games, including board ones such as ‘Hnefatafl‘. This game was similar in several respects to chess, and was very popular in Viking Age Scandinavia before the introduction of chess after the 12th century. It is also believed that the reputed Lewis Chessmen discovered in the 19th century on the Isle of Lewis, Outer Hebrides, Scotland could have been used for hnefatafl, chess or a similar strategy table game. It is rather debatable whether they were made in early medieval Norway or Iceland. Another indoor game was a competition of drinking and poetry: organised in pairs, men and women alike would gradually drink and recite verses of poetry. The main goal of this competition was to at least mimic the sobriety through a normal verbal aptitude and exclude the effects of alcohol. Additionally, the old Norse sagas account about the existence of various sports (referred to as ‘leikar’). These sports include, but are not limited to, the following: ball games, throwing games, wrestling games, and skiing. While the sagas only reference several ball games, they do not explicitly mention their rules. Knattleikr, a game probably quite similar to Irish hurling, was played by the Norsemen in Viking Age Iceland. It is documented in the sagas as occasionally involving a bat, possibly similar to the contemporary baseball bat. These outdoor games were generally practiced and attended during general assemblies, festivals of religious background or copious feasts. Among these games, the most notable one regarding physical strength was glíma. The game was basically a test of pure body strength similar to contemporary wrestling. Glíma was practiced in all the classes of the Norse society, inclusively by women, under different forms or variations, including, for example, swimming glíma which meant drowning the opponent until he would eventually give up. While the Grágás (the Icelandic medieval law code) clearly stipulated that a participant could withdraw at any moment during the game, injury and death were not uncommon at all. Last but not least, an early form of skiing was practiced by the Norsemen even before the start of the Viking Age. In fact, some of the earliest skis in the world were discovered in Sweden and Norway and dated about 4,500 years BC and 3,200 BC respectively.